Few things are prettier than an expansive field of lavender in bloom silhouetted against a blue sky — unless you're allergic to the stalky purple flower. Three varieties of lavender mean there's one species or another blooming from late spring through early autumn. And that's not the only place you'll encounter lavender. The plant is common in essential oils, air fresheners, cleaning products, lotions and products that are meant to relax you. However, the opposite can be true if you have a lavender allergy. If you have pollen allergies, it's a good idea to try to avoid planting anything in your yard that blooms. However, lavender actually makes the list of the top 16 flowering plants to avoid, according to Allergic Living. Plants such as lavender that have especially strong fragrances tend to exacerbate allergic reactions. Depending on where you live, lavender flowers can bloom nearly all year long; however, the purple blossoms are most common from May through late August. French lavender — Lavandula stoechas — appears earliest in the season, with its distinct little "ears" protruding from the top of each flower head. Blooms are most profuse in June and again in late summer. The showy blossoms paired with silvery aromatic leaves make this a popular garden plant in warm climates. It also yields more essential oil than common lavender, but is not as high in quality. Common lavender — L. angustifolia _— has a shorter blooming season of three to four weeks during midsummer, and a hybrid variety — _L. × intermedia — starts blooming about a month afterward, lasting until early autumn. Although sneezing and itchy, watery eyes are the most common signs of a lavender allergy, more severe forms of the allergy can disrupt everyday life. Allergic rhinitis — a chronic irritation of the nasal membranes — can cause your nose to be perpetually runny during lavender bloom. You can also suffer from a stuffy-feeling head that causes mental fog, interruption of sleep due to stuffiness, wheezing, and itching or fullness in the ears. Lavender effects from pollen could also cause a full-on asthma attack in sensitive people, as well as hoarseness or loss of voice. Although it might be tempting to dismiss the symptoms as "just allergies," medical complications can up the ante. Nose blowing and eye rubbing sometimes result in potentially dangerous infections that require medical treatment. Buildup of fluid behind the eardrum can cause ear infections, and throat swelling can cause the feeling of a blocked airway or exacerbate sleep apnea. Time off from work due to seasonal pollen allergies, plus the costs of doctors' visits and medications, add up to as much as $5 billion annually, according to Allergic Living. In the same way that you can have allergic reactions to lavender flowers growing outdoors, it's possible to have allergies to even the purest essential oil or other products made from the stuff. The offending element is linalool, the natural chemical that gives lavender its good smell. 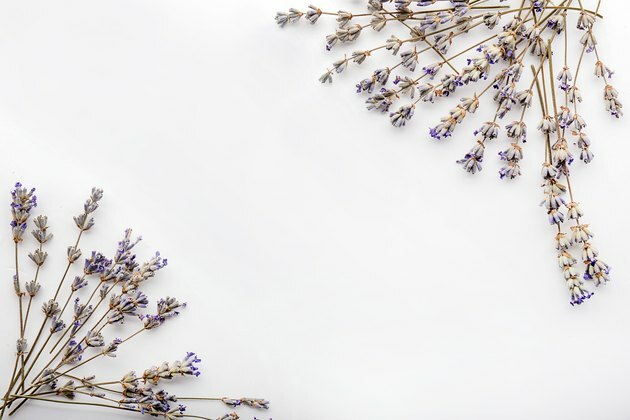 Unfortunately, if you're one of the people who's allergic to this terpene, you're prone to develop allergic reactions to lavender, such as rashes, hives or swelling, when you use lavender products on your skin. Ingest lavender as a flavoring ingredient, and your symptoms could range from a mild digestive upset to anaphylaxis. If you're allergic to linalool, there's some more bad news. Other fragrant essential oils also contain the substance, although to a lesser degree than lavender. Rosewood, lemongrass, frankincense and myrrh are just a few you might wish to avoid if you're prone to lavender allergy. Lavender's high linalool content not only makes it a great way to impart a relaxing scent to everything from soap to laundry detergent, its antibacterial and antifungal properties make it a prime additive for food and other consumables. Natural lavender and other linalool-rich plants aren't the sole sources. Linalool is also synthetically manufactured and added to scented products. If you have allergies to lavender and linalool, going unscented is crucial. However, some unscented products contain linalool to mask less-than-desirable natural odors, so read ingredient lists carefully. Read labels carefully on anything you consume, rub on your skin or inhale. At least 63 spices contain linalool, as well as the majority of cosmetics and many flavored beverages. Gum, candy, meat and baked goods all commonly contain the chemical, along with household cleaning products, insecticides and even floor wax. A potential lavender allergy isn't the only thing to look out for when using the plant in its many forms. Lavender's relaxing effects can slow down your central nervous system, according to WebMD. This makes it dangerous to use topically or ingest before going under anesthesia or taking sedatives. WebMD recommends stopping all lavender use at least two weeks before a surgical procedure. Don't use lavender products on boys who haven't yet reached puberty. The hormonal effects of the herb can cause abnormal breast development known as gynecomastia, according to a 2016 study published in the Journal of Pediatric Endocrinology and Metabolism. The study noted that some of the boys were exposed to Agua de Violetas, a fragrant body care product that contains lavender and is popular for use on babies and children in Cuban and other Hispanic communities. Lavender is found in roughly 70 percent of children's products, such as bubble bath, lotion and shampoo, due to its calming effect. Regular use can make a person more sensitive, resulting in an allergic reaction or other side effect from lavender or linalool. The effect on prepubescent girls isn't documented, and there are no scientific conclusions about potential effects on pregnancy or nursing children. But it's best to err on the side of caution and save lavender for adult use. What Is the Meaning of Lavender Flowers?